Posted on Thu, Mar 29, 2012 : 2:15 p.m.
Stephen Hopkins is listed at 6-foot, 228 pounds, but said he played fullback last season weighing 238 pounds. Stephen Hopkins played well at fullback after being moved there last season, but that doesn't mean he has the position locked down heading into the fall. Especially if he shows up for spring camp overweight, and a budding Thomas Rawls is taking snaps behind him. Michigan football coach Brady Hoke said on Thursday afternoon he likes what Hopkins has done through six spring practices — the seventh workout was slated for later in the day — but emphasized he wants the junior to "continue to grow from a maturity standpoint." "He's probably a little overweight right now, for what we like him," Hoke said. "When I say that, maybe the weight would be OK, if it was all good body weight." Hoke didn't say what Hopkins weighs. He is listed by Michigan as standing 6-foot, 228 pounds, but said in December he played last season at about 238 pounds. The Double Oak, Texas, native said he asked to be moved to fullback last season after Fitz Toussaint and Vincent Smith asserted themselves as the top two tailbacks. An injury to then-fullback John McColgan created an opening in the lineup, and Hopkins never relinquished it. Hopkins finished the season with 11 carries for 43 yards and one catch for 28 yards. But his hold on the position isn't resolute. When asked who were the biggest surprises of the spring, Hoke first mentioned Rawls. The Flint native played sparingly as a true freshman tailback last year, but coaches have been high on him since he first arrived on campus. Rawls still is taking most of his snaps at running back, but with Toussaint and Smith back next season, Hoke acknowledged he's tinkering with Rawls at fullback. He likes what he sees. 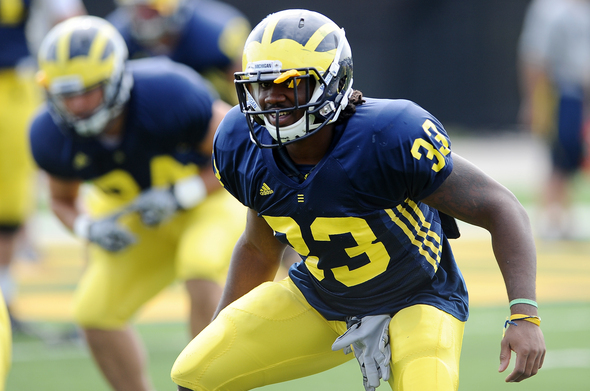 "He’s a pretty tough guy running the football," Hoke said. "He has to take care of the football a little better." Rawls had 13 carries for 80 yards last year. Sophomore walk-on Joe Kerridge also is getting snaps at fullback. Fri, Mar 30, 2012 : 11:43 p.m.
Rawls is getting snaps at FB so Michigan can get him on the field. The coaches are really high on the kid, but clearly prefer him at RB. Currently Michigan only has one true FB on their spring roster and that is Joe Kerridge who is a walk-on, but one hell of a lead blocker. Hopkins will be the main FB this year, but it is always good to have some kind of competition. Go Blue! Fri, Mar 30, 2012 : 9:50 p.m.
Kyle, IMO your headline here is disrespectful to Hopkins. All Coach Hoke said was that he needs to put good weight on instead of bad weight, and other than that he has been doing well in practice. Fri, Mar 30, 2012 : 1:30 a.m. I agree. I think we're reading too much into this article. Rawls is going to be a great back at UM, beit running or full. But Steph is definitely the starter this season at FB and I don't see him losing that job. He's more of a FB than RB anyway. Its a natural fit for him. He don't get a lot of press right now, but I'm anxious to see Drake Johnson is gonna do. He's my sleeper for the future UM teams. GO BLUE! Thu, Mar 29, 2012 : 9:38 p.m. I watched the press conference. This article is a little blown out of proportion. Hoke said Rawls is standing out at tailback and is getting &quot;a little, not a whole lot&quot; of reps at fullback. Also keep in mind that Borges' fullbacks are more than lead blockers. It would be nice however to see Rawls and Toussaint on both sides of Denard. Im exited to see Rawls have a bigger role on team 133, but Steph has Hopkins on lockdown. Hes doing a great job, but needs to harden up a little but. Thu, Mar 29, 2012 : 9:39 p.m.
Thu, Mar 29, 2012 : 8:44 p.m.
With #5 fullback recruit Houma coming in this year and #1 fullback recruit Shallman coming next year, Michigan is set a fullback for years to come. Rawls, Houma, Shallman and Deveon Smith are all heavy hitters. Thu, Mar 29, 2012 : 7:16 p.m.
great to hear Rawls is in the mix! Love the kid! Thu, Mar 29, 2012 : 6:45 p.m. Nothing like good competition to keep the guys honest. I would hope that Mr Hopkins is good pals with the rejuvinated Will Campbell about attitude and refocus (per recent article). Stephen Hopkins in a Junior so the light switch better go on in his head sooner rather than later to rededicate himself. If not, he'll be left in dust by the available tailbacks and fullbacks want-to-be's. As a fan, I hope to see the best man on the field at any given position and I totally trust Brady Hoke and staff is doing that.